The Airco DH.5 was a British First World War single-seat fighter aircraft designed specifically to replace the obsolete Airco DH.2. It was one of the first British fighter designs to include the improved Constantinesco gun synchronizer, which allowed a forward-firing machine gun to fire through the propeller faster and more reliably than the older mechanical gears. It was also one of the earliest biplanes to feature a marked "back-stagger" of its wings. The DH.5 was inferior to other fighters already in production, and proved unpopular and unsatisfactory in service. It was replaced as soon as supplies of the S.E.5a permitted. 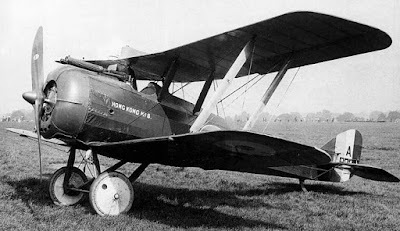 Captain Geoffrey de Havilland designed the Airco DH.5 to combine the superior performance of a tractor biplane with the excellent forward visibility of a "pusher" type. The construction was that of a conventional tractor biplane of the time, but the mainplanes were given 27 inches of backward stagger, so that the lower wing was positioned forward of the upper wing. In the prototype armament installation, the forward-firing .303 in (7.7 mm) Vickers machine gun was either fixed to fire upward at an angle or possibly mounted so that its elevation could be adjusted in flight; in the production installation the gun was given a more conventional fixed mounting on top of the cowl, offset to the left, to fire in the line of flight. As the pilot was seated forward of the centre of gravity, the main fuel tank was necessarily behind the cockpit, below the oil tank. An auxiliary gravity fuel tank was fitted over the top mainplane, offset to the right. 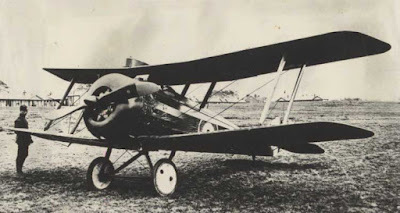 By the time the prototypes of the DH.5 underwent service trials in December 1916 in France, superior types such as the Sopwith Camel and the Royal Aircraft Factory S.E.5 were not far behind. In fact, the new fighter was inferior in most respects to the earlier Sopwith Pup. 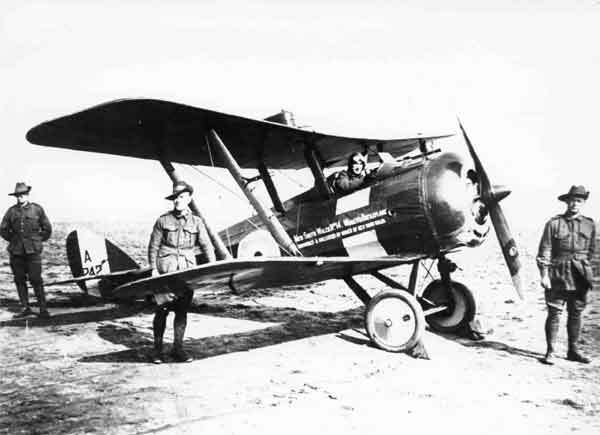 The provision of a single machine gun at a time when most fighters carried two also meant the aircraft was somewhat under-armed for operations in 1917. Nonetheless, the DH.5 was ordered in quantity from four manufacturers: Airco (200), British Caudron (50), Darracq (200) and March, Jones & Cribb (100). In service the type proved unpopular – its unconventional appearance led to rumours (largely unfounded) of handling difficulties. What was true was that its performance rapidly dropped off at altitudes over 3,000 m, and that while it was very manoeverable, it tended to lose altitude quickly in combat. The unusual position of the upper mainplane resulted in an unfortunate "blind spot" above and to the rear (the very direction from which a single-seater was generally attacked). On the other hand, the robustness of its construction, its good performance at low altitude, and the pilot's good forward field of view made the aircraft a useful ground-attack aircraft. In this role, the type served with distinction in the Battle of Cambrai. The DH.5 has the historical distinction of having formed the initial equipment of No. 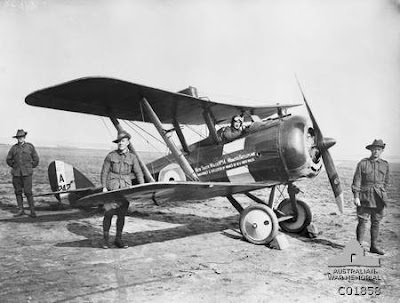 2 Squadron of the Australian Flying Corps - the first Australian fighter squadron. It did not prove satisfactory, serving mainly in the ground-attack role until December 1917, when it was replaced by the S.E.5a. By this time, the withdrawal of the type from the Western Front was already almost complete - the last DH.5 squadron receiving the S.E.5a in January 1918. 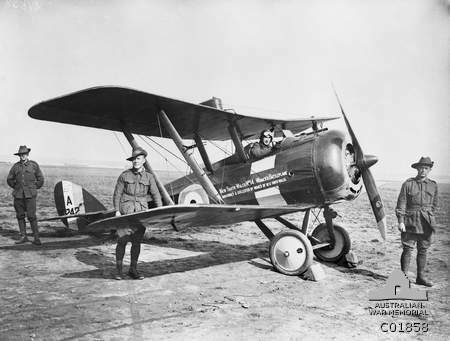 DH.5s issued to training units proved unpopular and the type soon vanished from RFC service. No original aircraft has survived, but an airworthy full-scale reproduction, built in the United States by John Shiveley, is on display in the Aviation Heritage Centre, Omaka Aerodrome, New Zealand.